This is just an OK book about O.J. Simpson. Oh, I’m sorry, it’s not about O.J. Simpson? He’s just talked about incessantly? So, this is a pretty good suspense-mystery that is not about O.J. Simpson. But who are we kidding? There really is no O.J. mystery. 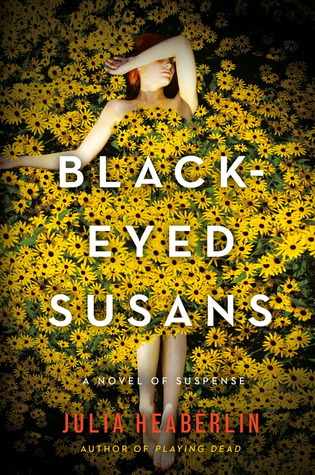 Black-Eyed Susans follows Tessa, the only surviving victim of a serial killer. Known as “the lucky one”, her body was left in a ditch covered in the ominous yellow flowers and surrounded by the remains of three other women. Now 32, with a daughter, and a life she’s scraped together with determination and strength, Tessa has to face the consequences of the testimony she gave at her accused killer’s trial…because she’s not totally convinced the right man is behind bars. With the execution looming, Tessa teams up with the inmate’s lawyers and forensic experts, to find the truth. Who were the other victims? Is her killer still free? Where did her best friend disappear to fifteen years ago? And who keeps planting black-eyed-susans in her garden? And ALSO, just what do Americans think Canadian bacon is? Also known as peameal bacon or back bacon. It is not ham. Or even ham-like meat. Whatever you are being sold in your grocery stores as Canadian bacon is utterly wrong. A lie! And it does not go on pizza, Tessa! Flipping back and forth between 1995 – when Tessa was in therapy, preparing for the trial – and present day – where Tessa is seeking out answers, to protect herself, but mostly to protect her daughter – I found this to be a slow burner with ambitious goals. And I can’t honestly say it allllllll worked for me. I’m definitely not coming away from this with hearts in my eyes, but I don’t have anything terribly negative to say about it either. I know, it’s more fun when I’m evil. I agree. The writing is technically engrossing, and I would say way above average for this genre (no offence to the majority). There is just something about Heaberlin’s prose that are beautifully crafted, even when speaking about forensics or court proceedings. I think this is what kept the sedate pace of the story-telling from knocking me out cold. Teen Tessa’s appointments with her therapist were by far the most interesting chapters in the book. Teen Tessa comes across as an almost unreliable narrator in her own life, something to keep things interesting. Whereas Adult Tessa seemed to have forgotten what her personality was. She was bland and lacked any emotional tangibility, creating “present day” chapters that were wanting. As far as the mystery itself goes, the new information discovered felt genuine instead of “shocking”, and the science behind it was interesting and seemingly well-researched…but honestly, I no do science good…so as long as the author sounds like they know what they’re talking about, I’ll buy it. Does that make me gullible? Maybe. People tell me I am, and I have no reason not to believe them. As for the twist ending, my biggest problem with it was that Heaberlin dropped the suspense and realism and opted instead to take more of a gimmicky path. She kept the truth at such a distance from me as a reader that it didn’t come across as a clever surprise, as much as it did an oddity to the rest of the novel. The first 85% of the novel feels genuine, human and, despite the lead’s lack of emotional availability, it was engrossing in its honesty of the justice system, surviving trauma and forensic work. But the ending was a put-on, as if trying to be something it wasn’t. There was no lead up (that I caught onto,) so it came across like an ending to a different novel. And also, that ending that was dragged out unnecessarily. Tessa had a lot of tools at her disposal to amp up the pace and tension, but she kept that snail’s pace blah-ness to everything she did. I wouldn’t call this creepy or a thriller, or really even psychological. It lacked menace, with the only threat of a maybe-killer being some flowers planted in a garden and someone stealing people’s gardening spades in the middle of the night. I mean, come on. But it is a decent mystery, with beautiful prose and a mostly thoughtful plot. So I can’t hate on it too much, but I also didn’t love it. That emotional spark I’m looking for when I read was missing in the home stretch, and that ending was too disjointed to me. It’s just the most okay-est! Posted on March 19, 2018 January 30, 2019 by Krystin RachelPosted in 3 Stars, Reviews, Surname: A to LTagged black-eyed susans, book, Book Blog, book rec, Book Review, Books, Bookworm, Crime, Crime Fiction, julia heaberlin, Mystery, Opinion, Read, Review, suspense. Next Next post: Book Tag: Anything But Books!